More CW news is out there talking about a character from their new, upcoming hero series, Legends of Tomorrow, and his name is Carter Hall/Hawkman and he will be joining Hawkgirl on the show. But before he shows up in Legends, he will be making his appearance first in both Arrow and The Flash! There aren't any concrete details on Hawkman's appearances yet, but I'm guessing they will be one up appearances in each show. Maybe even a cross-over involving the flying man. 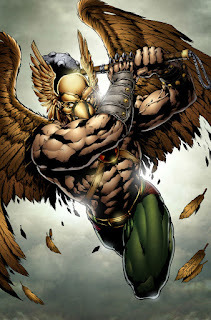 Remember, Hawkman is a 5,000 year-old character, Well, his mind is 5,000 years old, because he reincarnates and each incarnation retains the memories of his past lives.